Pretournament favourites France will face Belgium today in the first semifinal match of Russia 2018 World Cup. 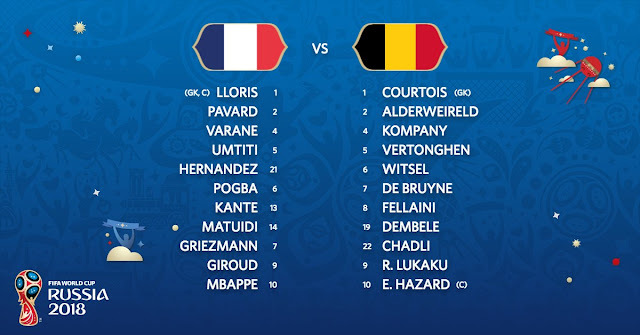 France XI vs Belgium: Lloris; Pavard, Varane, Umtiti, L.Hernández; Pogba, Kanté, Matuidi; Mbappé, Giroud, Griezmann. Belgium XI vs France: Courtois, Alderweireld, Kompany, Vertonghen, Chadli, Fellaini, Dembele, Witsel, De Bruyne, Hazard, Lukaku.